University of North Texas Press, Forthcoming November 2018. Winner of the Katherine Anne Porter Prize, Judged by Dolan Morgan. “Eric Schlich’s stories are clever and moving and disarmingly precise.” —Dolan Morgan, judge. Quantum Convention’s eight genre-bending stories balance precariously between reality and fantasy, the suburban and the magical, the quotidian and the strange. In this collection, Eric Schlich features a range of characters labeled as “outcasts” by society—whether physically, morally, or fantastically: an alcoholic lucid dreamer, a closeted bisexual, a bachelor time-epileptic, orphans-turned-keeners, a vengeful banshee, a nerdy cyclops, and more. “From a conference of one’s various selves across the multiverse to the movie set for The Wizard of Oz, each of Quantum Convention’s eight stories feels like opening a funhouse door on a new adventure. This is a kaleidoscope of dazzling fiction, and an excellent book.” —Anne Valente, author of Our Hearts Will Burn Us Down. “In one spellbinding story after another, debut author Eric Schlich melds the surreal and the all-too real in wondrous ways. I absolutely loved these stories.” —Elizabeth Stuckey-French, author of The Revenge of the Radioactive Lady. “In Quantum Convention, the familiar is made strange and the strange is celebrated gleefully. These unexpected and brilliant stories introduce an author as skillful with a daring speculative twist as he is at rendering the subtleties of marriage, loss, and growing up.” —CJ Hauser, author of The From-Aways. 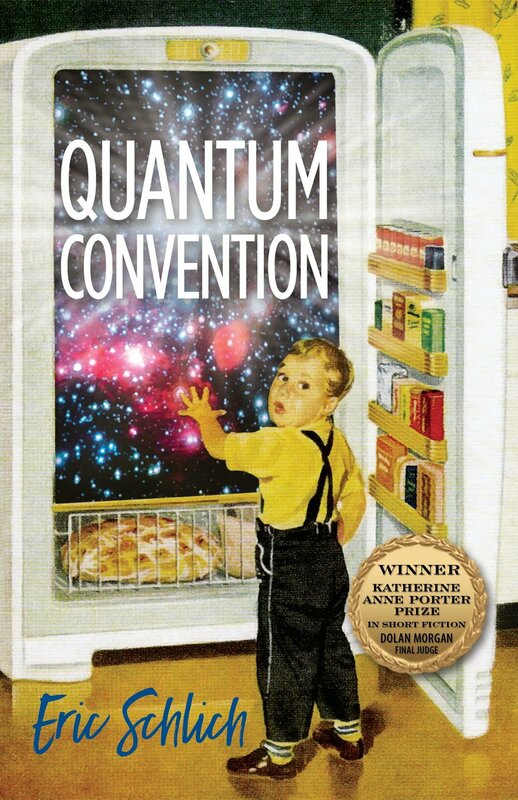 “Quantum Convention is one of the finest books I’ve read in years. It is so rare we encounter a work of art that simultaneously astonishes us with its inventiveness and beauty while also granting us entry into the gripping lives of characters we care so deeply about.” —Jesse Goolsby, author of I’d Walk With My Friends If I Could Find Them.